I know, I'm late. BoGD's fabled "Swap Meet Finds" feature is usually a weekend affair but I decided to spend most of my Sunday watching both the Ravens and even the Steelers bottom out at their handegg games. 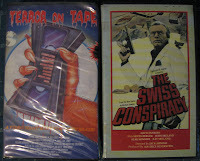 The first are the clamshells with a cut big box of Terror on Tape and uncut The Swiss Conspiracy. I've been searching for a copy of Terror on Tape; a '83 horror scene compilation from the big box catalog of Continental Video hosted by a hit-rock-bottom Cameron Mitchell. This great review over at Bleeding Skull first turned me onto it and like noted there this probably will never received an official DVD release due to all the copyright shifts since then. 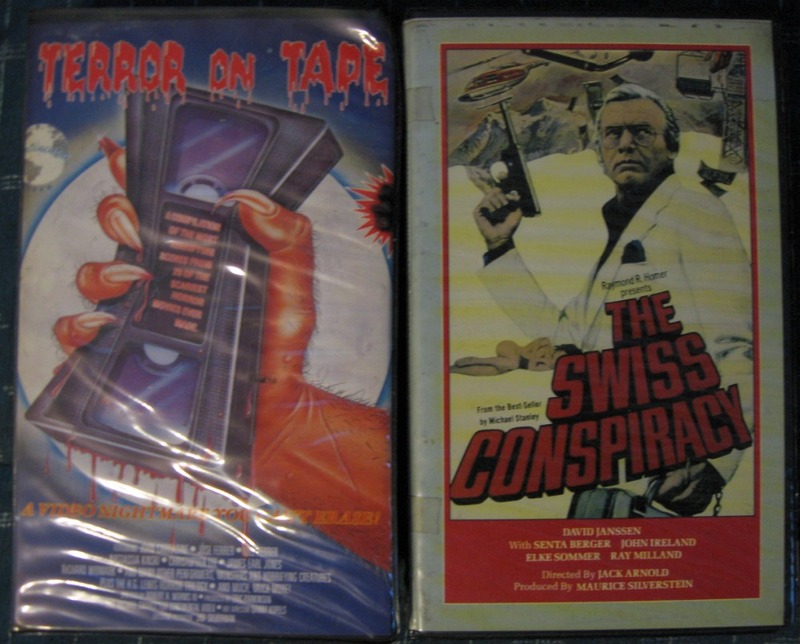 The Swiss Conspiracy was purchased merely because it's a United Home Video uncut clamshell in great shape. The yellow "waves" in the plastic aren't stains on the cover. Next up are Trans World Entertainment "hard" clamshell of Thunder Warrior II (Thunder II) and the United Home Video clamshell of Chamber of Horrors (The Door with Seven Locks). 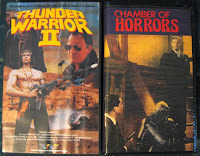 I've looking for a copy of the Thunder Warrior sequel since I have three or four copies of TWE's VHS of the first. I have the Francesco De Masi CD soundtrack to these films...somewhere. 1940's Chamber of Horrors isn't exactly something I'd rush to watch but United later released the film with the exact same art in a standard cardboard slipcase which is just boring. Here's the smaller, mostly cut up, hard cases I dug up. Andrzej Zulawski's Possession is a film I fell into watching every day a while ago while exercising for weeks. It's utterly hypnotic. This Anchor Bay out-of-print VHS and their DVD sell for a pretty penny, but hopefully Mondo Vision schedule their DVD release soon. It should blow away Anchor Bay's presentation if their other Zulawski discs are any indication. Massacre at Central High is a "back-up" copy of Electric Video's release as I have an uncut cover copy already. Terror in Toyland (You Better Watch Out / Christmas Evil) is the butchered big box from Academy Video. Finally snagged a VHS (instead of Beta) of Ted Nicolaou's Terrorvision. The hilariously MST3K-lampooned Mitchell is probably the first home video release of the film being from its home studio, the long defunct Allied Artists. Xtro is Thorn EMI's release and might be still factory sealed. Forty thousand copies of Terror in the Aisles must have been printed because I find this Universal Studios horror compilation hosted by an embarrassed Nancy Allen and Donald Pleasance everywhere. 1984's The Wild Life still remains absent from DVD by Universal. Still haven't watched it, despite also having the Laserdisc, but with Chris Penn, Eric Stoltz, Lea Thompson, and written by Cameron Crowe it'll land on the short stack. Strange Shadows in an Empty Room (Blazing Magnums) isn't a gialli (thoughts here). Slavegirls from Beyond Infinity is the original Urban Classics release. Forum Home Video's unrated Scarecrows (1988) was very valuable before MGM had to go and spoil the fun with their DVD release. You usually always find them on tape only after their digital debut. The Stay Awake was released on DVD by Image Entertainment, but it's long out-of-print and expensive. This last one deserves special attention; All American Video's Beta and VHS of School of Death (El colegio de la muerte) (1975). I actually bought the Beta on eBay a while back with the mint cover and case for a song from a seller just beginning to sell (always the best time for deals) his massive Betamax collection. The VHS was in a grotty box under rusty tools and papers with just the edge sticking out. The cassette was dirty and splattered with crud but it cleaned up like new. I have it in a blank case now but the Beta's case is actually a universal tape Amaray case that's designed to hold with VHS, Beta, or Video2000 tapes. So it doesn't really matter the VHS didn't have its proper case. I too, recall reading that Terror on Tape review at Bleeding Skull. Dude I wish I could find some of the things you do... I'd love to see most of these treasures. I am always amazed reading your blog and Horrorhound magazine that there all of a sudden seems to be a collector's market for VHS wether or not the titles are currently available on dvd. 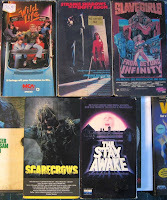 I can't tell you how many bigbox vhs titles I sold in yard sales for a buck apiece (or less) because I could find no one in the online community who showed any interest in them. And we're talking stuff like Thriller Video Make Them Die Slowly and Wizard Video Breeders. I still have quite a bit left. Would you want me to send you a list?